Misuse and abuse begin in a lack of understanding. If you see a powerful implement−heavy-duty cord and lots of technical looking settings−and you don’t know precisely what it is for, do us a favor and Do Not Touch! Vision is a necessary tool; and like any power tool it can be dangerous when misused and abused. The 21st Century leader not only understands the power of Vision, she knows how to use it. The proper use of vision by a 21st Century leader is grounded in personal purpose. There is first this internally rooted purpose which then flows externally in the form of clearly articulated vision. So, what is the connection of individual purpose and collective vision? It is visualization. When the 21st Century leader’s messaging is clear, we are brought into the moment. We take the clearly expressed vision and begin to self-describe what it looks like to us. Such positive visualization of our collective story releases individual creativity and thus builds sustainable present action. Personal purpose brings one into A New Confidence. When confidence is low, or missing, look for missing purpose. When a leader is truly clear, we are led individually to open to, and see, the collective possibilities; a collective future vision begins to become more individually organized in the present. Sure, we need a vision to stand by and give meaningful support to our actions. I know this sounds like purpose, but it is not necessarily so. Purpose is first individual. And when that propels us through our own connective cycle, then we stand firm in the collective and share a vision. We are transformed by an ever-evolving awareness. And our confidence is deepened in action that is connective−bringing together the clarity of application with purpose. Action that is connective is so because it flows in a cycle. Purpose is the foundation of all vision of Impact. To more clearly understand a vision of any substance, look deeply into the values held by the individuals. 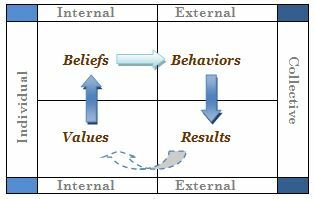 If the vision is truly compelling it is because of the connective cycle that is the flow of Values to Beliefs to Behaviors to Results. This is 21st Century sustainability at its best. So, if you are the leader everyone looks to for the vision, don’t let them down. If you are one looking to a leader for the vision, give your all to assure clarity and connection. Then together we can give our individual energy for collective impact. Together we are transformed, driven by individual purpose and drawn into a collective vision. This entry was posted in A New Confidence, Transforming Trueness and tagged 21st Century Leadership Skills, Clarity, Connection, Purpose by Jeff Brunson. Bookmark the permalink.